CommuniGator Help SiteGatorMailAudience ContactsHow to create a campaign that sends out on a contacts birthday. Go to Audience -> Groups. Then select 'Add New Group'. Type in the Name and Description. Add a second rule for the month, and enter datepart(m,GETDATE()). Once you have added the two rules you need to make sure that the clause used is AND, this can be selected from the drop down menu as circled. This will then get all of the contacts where their DOB day and month matches today's date. 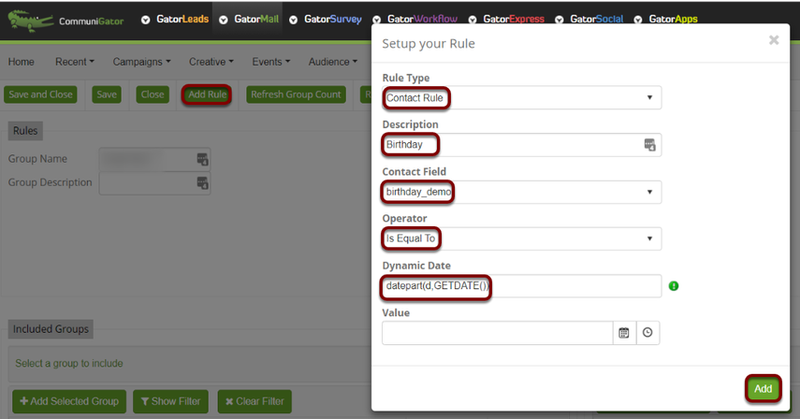 Once you have set up the rules relevant to your campaign, click Save. Once you have done the first campaign and saved it you will then need to create another six campaigns so you have one for each day of the week. You can then copy the first one you have made but make sure that you have the correct email design attached, and most importantly change the start date to correspond to the correct day, so the campaign send on the right day.